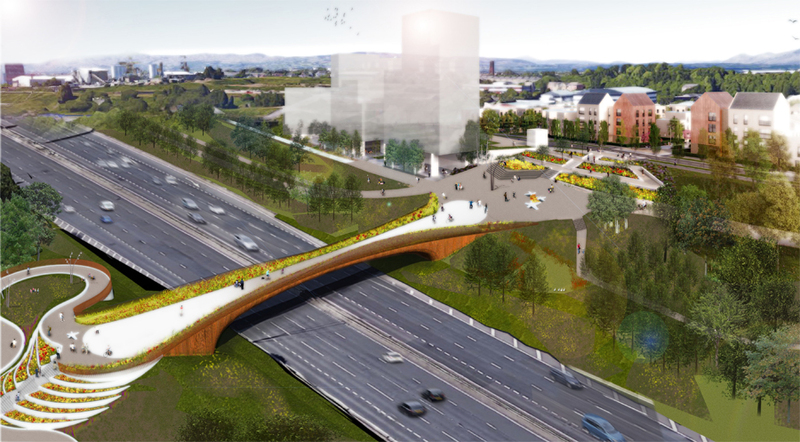 GLASGOW City Council is about to submit a planning application for a new pedestrian and cycle bridge over the M8 motorway connecting Sighthill and communities in North Glasgow to the city centre. The new bridge — described as a ‘street in the sky’ — will replace the existing one with a structure that is far more attractive and fit for purpose, with landscaping on both the northern and southern approaches forming new civic spaces that allow free flowing movement for all with special places to pause and enjoy the environment. George Square is less than 15 minutes’ walk from the bridge via Baird Street and North Hanover Street. The bridge will be a landmark project in the £250million Sighthill Transformational Regeneration Area (TRA) — the biggest such scheme in the UK outside of London. Key dates in the creation of the new bridge, designed by Jacobs, are the contract award in spring 2019, construction beginning in mid-2019, with completion expected in Summer 2020. The bridge span will be just over 58 metres (191 feet), and its width varies between 20 to 7.5 metres. It will weigh 2,420 tonnes (420 tonnes steel, 2,000 tonnes concrete) and its structure is a steel box girder with a reinforced concrete composite desk slab. 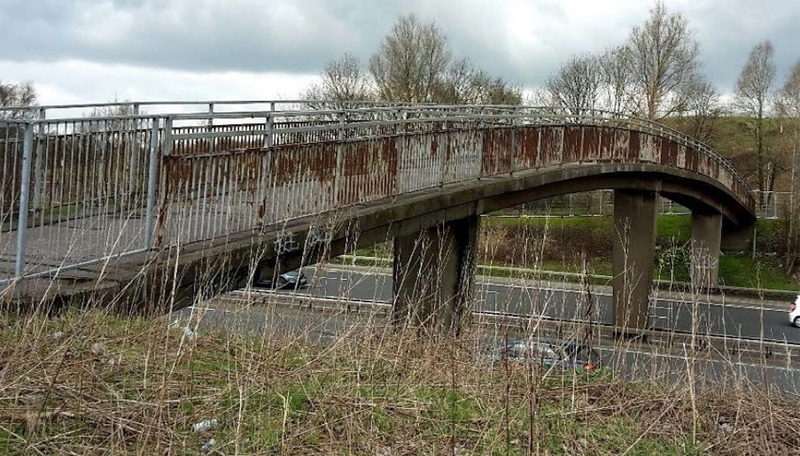 The approach taken to its design means that the bridge will need minimal maintenance and will also not require painting therefore reducing disruption to the motorway. The parapets are designed to emphasise key views across the city skyline yet obscure direct lines of sight to the motorway below. The paved bridge deck is an hour-glass form that varies in width. Councillor Susan Aitken, Leader of Glasgow City Council, said: “This new bridge will form a gateway to both Sighthill and the city centre. For far too long, neighbourhoods just on the periphery of the city centre have been forgotten or abandoned. Sighthill has typified this neglect, cut off from the heart of the city by the M8. 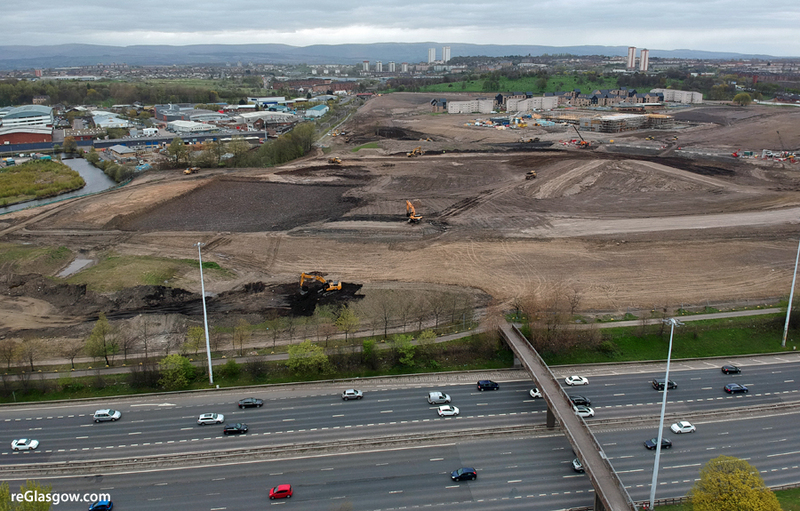 Once the Sighthill TRA is complete, it will have transformed approximately 50 hectares of land and parkland, a large area of which was contaminated because of its industrial past, when a number of heavy manufacturing factories were based in the area. An enhanced neighbourhood — immediately beside the city centre, just 15 minutes’ walk from George Square — will have been created for existing members of the local community and for new residents choosing to move to Sighthill, with almost 1,000 new homes of various tenures. Some of the other features of the regenerated Sighthill will include a new community campus school, and a new road bridge over the Glasgow to Edinburgh railway line improving the connections between Sighthill and neighbouring communities. The parkland and the greenspace of the area will also be significantly improved, and a new public square, new shops and businesses will come to Sighthill. Sighthill will be reconnected to the Forth and Clyde Canal at the Pinkston basin, with a terrace transforming the area. Land remediation — now complete — has made the delivery of these new features possible. The £250million regeneration of Sighthill is being funded by Glasgow City Council, the Glasgow City Region City Deal, Glasgow Housing Association and the Scottish Government.